Three of Central Asia’s republics, Tajikistan, Uzbekistan and Turkmenistan, border Afghanistan along a frontier agreed to by Russia and Britain during the late 19th century. The border deal was an outcome of the so-called Great Game. While Russia annexed the Central Asian khanates of Kokand and Khiva, and the Emirate of Bukhara, the territory ruled by the Emir of Afghanistan fell within the British sphere of influence, providing a buffer state between Russia and British-ruled India. A consequence of this territorial partition was the creation of the so-called ‘pan handle’ in northeast Afghanistan reaching out to China. Known as the Wakhan Corridor, it lies deep within the Pamir Mountains and, even today, it is a difficult area to reach. There are only about 1,500 households in this 220 mile-long corridor, which includes Afghanistan’s highest mountain, Noshaq, at over 24,500 feet. At its narrowest, the corridor is about 10 miles wide, and is 40 miles across at its broadest point. Afghanistan remains best connected to its eastern and western neighbors, Pakistan and Iran respectively, although links with former Soviet Central Asia are slowly opening. It is no longer just opium, Afghanistan’s most famous export, that filters across these borders. The Uzbek border with Afghanistan stretches for 130 miles. When the Soviet army occupied Afghanistan in 1979, military planners built a bridge across the Amu Darya connecting Termez in Uzbekistan and Hairaton in northern Afghanistan. Initially the railway that traversed the bridge just looped around, designed solely to ferry Soviet supplies across the border. The railway has now been extended the short distance to Afghanistan’s northern city of Mazar-i-Sharif, north of Afghanistan’s Hindu Kush Mountains. 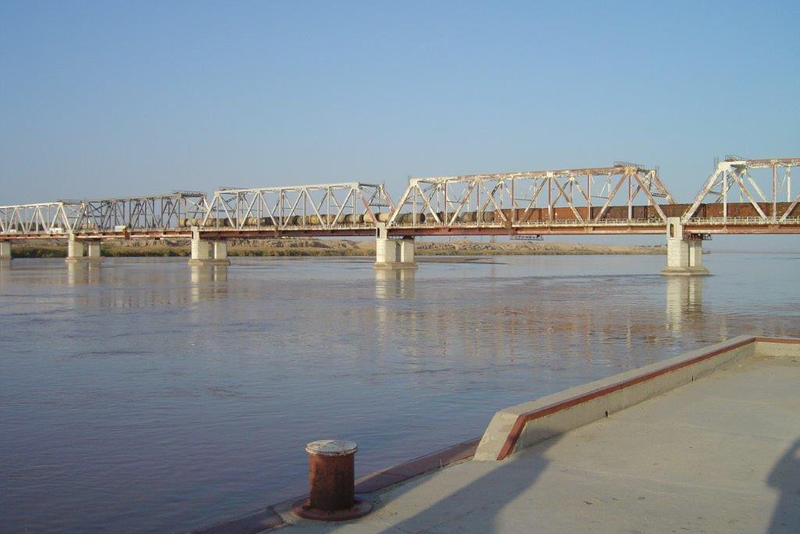 The bridge over the Amu Darya remains the only fixed link between Afghanistan and Uzbekistan. Another rail link connects Afghanistan and Turkmenistan at a crossing in the Karakum Desert south of the oasis of Merv, or Mary. This is the main crossing point in the 500-mile frontier between the two countries. Plans to extend the line southwards to Afghanistan’s eastern city of Herat have yet to materialize. The border here was settled in the 1880s after Russian Cossacks and the British-officered Indian troops came close to clashing at the remote oasis town of Pandjeh. This was the most famous near- encounter in the Great Game. These days, concerns about the northward spread of Islamic militant ideas out of Afghanistan make the leaders of Turkmenistan and Uzbekistan wary of opening these border any further. Tajikistan has the longest border with Afghanistan at around 810 miles. The eastern edge of the border winds through mountainous terrain along the northern edge of the Wakhan Corridor. Here, the high Pamirs dominate both sides of the border and there are no roads, or accessible crossings. Mountain passes between Tajikistan, Afghanistan, China and Pakistan are found at above 13,000 feet. Further west, two rivers – the Amu Darya, and its tributary, the Pyanj – mark the Tajik-Afghan divide. Several bridges that span the border are open to locals. The trade route south of the Tajik capital Dushanbe connects to the Afghan regional capital of Kunduz over a bridge at Shir Khan Bandar. Chinese trucks that have made the long haul from Xinjiang via the Pamir Highway reach Afghanistan by this route. Nicholas Nugent is a writer and broadcaster specializing in Asia and the former Soviet Union.